Fundraising on St Patrick’s Day! 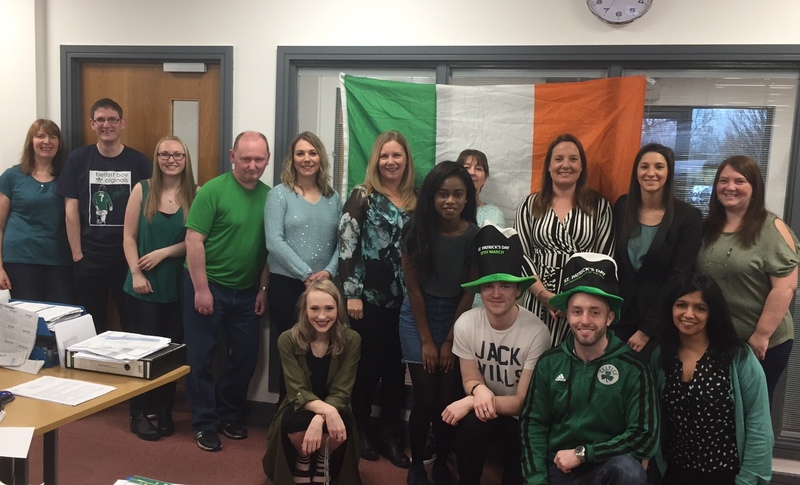 On Friday 17th March we celebrated St. Patrick’s Day here at the office for a bit of fun but to raise money for a charity too. The day was fun and green, in typical St. Patrick’s Day spirit! Last month saw a new addition to the Credit Union family as Kevin (pictured above in the green jacket and hat) filled the vacancy of Compliance Officer. Kevin suggested the idea of donating money to a charity in exchange for a non-uniform day, a raffle and various Irish treats! Having been born in Ireland, Kevin organised Friday’s activities and even donated the raffle prizes himself. The chosen charity for this day was Dementia UK. This charity offers specialist one-to-one support and expert advice for people living with dementia. We managed to raise a total of £141 for Dementia UK – which we’re really happy with from only one day of fundraising! We like to support different charities and each one is usually suggested by a member of staff. We have previously raised money for Cancer Research UK, St Ann’s Hospice and COPS too. Once again we’re proud of our staff for getting involved and helping to support another great charity.